I've been fighting a cold over the past week, so all I can think about is soup instead of sushi. I'm not usually a huge ramen fiend, but a sore throat, the erratic weather (below 70 degrees here in So Cal? What?!) and the opening of L.A. ramen mecca Daikokuya's first outpost in Orange County have inspired cravings. Gluttonista-Noodle Girl pal Kat also happens to be an expert, and she's the one who hipped me to the new Daikokuya in Costa Mesa. We enjoyed a very satisfying lunch there. That kicked off my ramen cravings - and made me realize how oblivious I'd been to all the ramen places that have popped up in Orange County in recent years. I found myself craving some for lunch again a few days ago, and rather than go back to Daikokuya (which I'll do some other time, for sure), I did a little ramen research to diversify, and to find a spot closer to work. Thanks to Keizo and his Go Ramen Map, I realized Kairakutei, popular on ramen blogs, was minutes away. I rushed over, my mouth watering, and enjoyed a very satisfying, flavorful bowl of the tonkotsu-miso ramen: rich, thick, salty goodness with decently tender chasu pork slices and plenty of my favorite wakame. The soup was a bit oilier than I would have liked, but I figured my cold-weakened body could use all the fat and salt it could get. I must say I prefer the Daikokuya ramen for its more subtle flavors and that yummy marinated egg, but it's nice to know there's a decent runner-up right by the office. I'll have to return to Kairakutei to try another flavor. 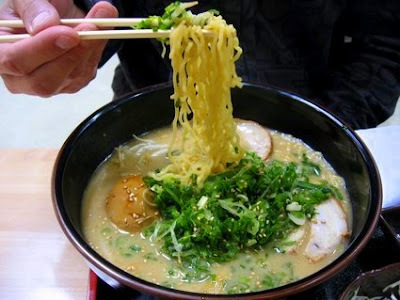 "I'm not an expert on ramen by any means, but there are plenty of Ramenistas in the blogosphere to expertly lead you to the best joints: Go Ramen, The Ramen Blog, Journey into the World of Ramen ..."
was clicking around, and your clever blog name totally caught my eye! big points right there! Rameniac, apologies for the omission! Glad you commented so you're now officially mentioned :) and when I get my blogroll going, I'll be adding you for sure! Hello iy! Thanks for the mention. I started my blog with the same inspiration. Glad to hear someone actually used that map!